WASHINGTON (CNN) -- A national poll suggests that nearly three-quarters of all Americans support the plan to withdraw most U.S. combat troops from Iraqi cities and towns, even though most respondents said they think the troop movements will lead to an increase in violence in that country. 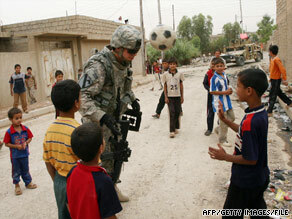 A U.S. soldier plays soccer with children in mid-June in the northern Iraqi city of Mosul. The CNN/Opinion Research Corp. poll comes Tuesday, the day of the long-anticipated deadline for American troops to pull out of Iraqi towns and cities. The U.S. military gradually has been moving its combat troops out of Iraq's population centers for months to meet the deadline agreed to by Washington and Baghdad. Since January, Americans have handed over or shut down more than 150 bases across the country, leaving U.S. troops in a little more than 300 locations that gradually will be handed over to Iraqi control. The United States has pulled about 30,000 troops out of Iraq since September, leaving about 131,000 troops there. Seventy-three percent of Americans questioned in the poll favor the withdrawal of U.S. combat troops from Iraqi cities and towns, with 26 percent opposed. "This plan has widespread bipartisan support," said Keating Holland, CNN's polling director. "Seventy-two percent of Democrats and 74 percent of Republicans favor this move." "Nearly two-thirds say that the U.S. should not send combat troops back into Iraqi population centers, even if there is a significant increase in the number of violent attacks," Holland said. "Americans seem to believe that once the Iraqis are in charge, it's up to them to solve any future problems." The war in Iraq remains unpopular, with about one-third of the public supporting U.S. efforts there. The CNN/Opinion Research poll was conducted Friday through Sunday, with 1,026 adult Americans questioned by telephone. The survey's sampling error is plus or minus 3 percentage points. More than 4,300 Americans have been killed in Iraq since the 2003 invasion. The latest deaths happened Monday when four U.S. soldiers serving in Baghdad died of combat-related injuries. The U.S. military announced the deaths Tuesday without giving further details.